I know, I know. More shrimp?! It seems to be a weekly or bi-weekly dinner item in our house. I’m sorry if you’re sick of shrimp recipes, but this one was too good to not share. I know the title says “grilled,” but I skipped that step due to early darkness and coldness. Of course, this is southern California so by “coldness” I mean requiring-a-light-jacket. Still, I needed to take decent pictures so I used the stovetop instead of a grill. 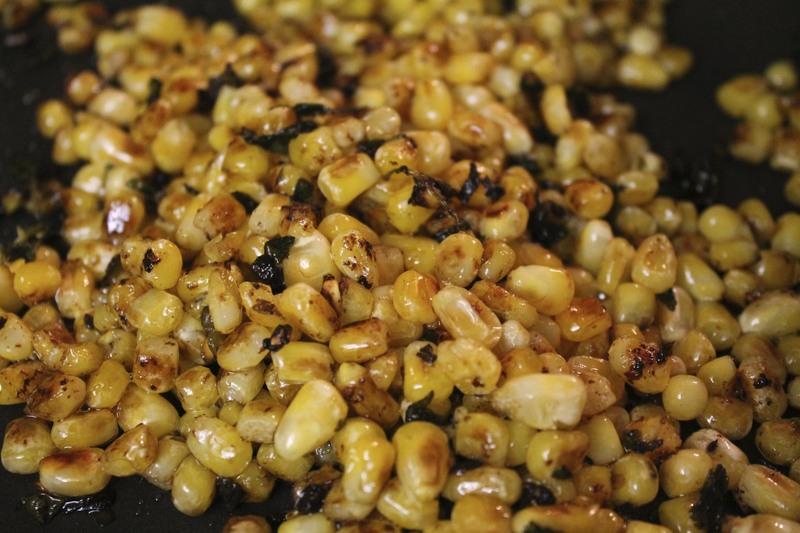 If you try this recipe out in the summer time, by all means grill the shrimp and the corn on the cob! It will give it a nice, smoky depth. My SO has been asking for a light dinner. I made a sinful baked mac and cheese from my new Fine Cooking recipe (thanks, Deb-Mom!) and to say it weighed us down is an understatement. So the next night, I followed up the rich dinner with a light one. First, I whisked up some olive oil with about 5 Tbsp. 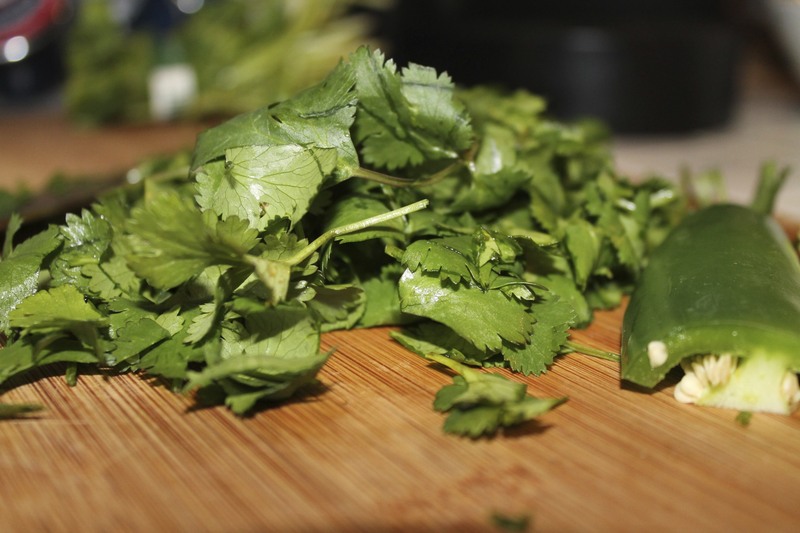 of fresh lime juice, then mixed in chopped jalapeno and cilantro and some cumin. 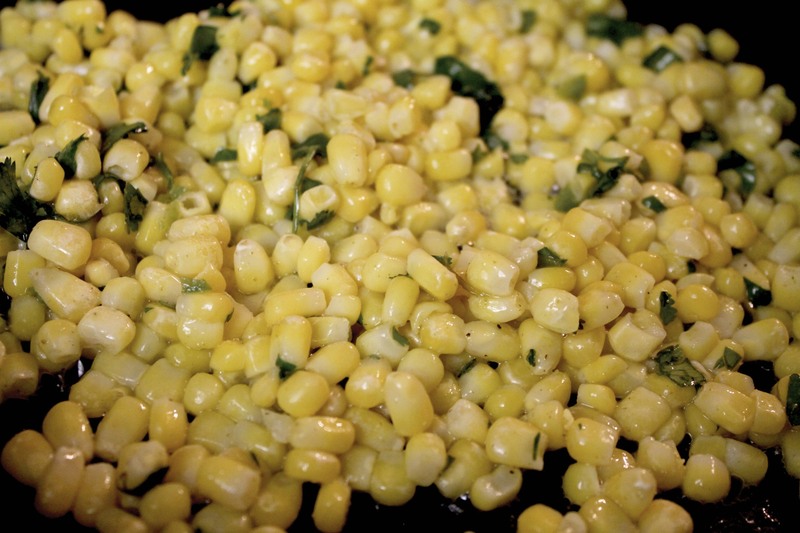 I could’ve eaten a bowl of that sauteed corn by itself. It was TASTY. Then I threw about 1 Tbsp. 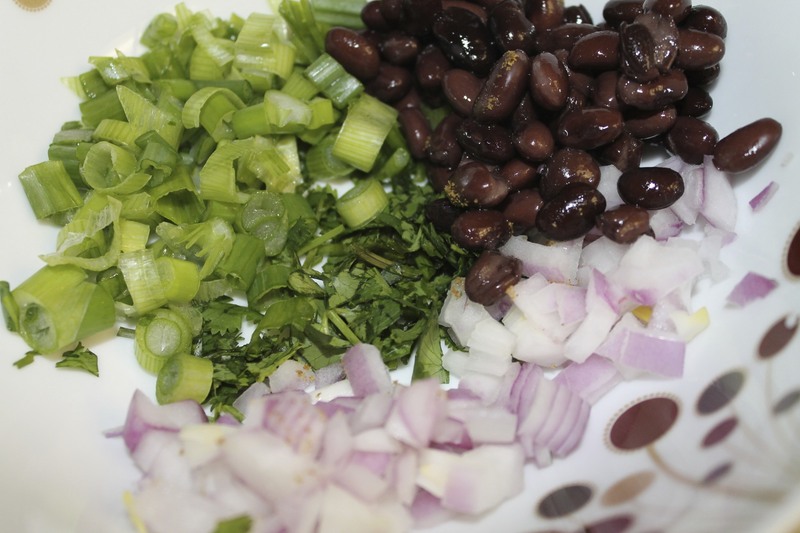 of chopped cilantro into a bowl (I made a total of three bowls.) I added to it 2 Tbsp. chopped red onion, 2 Tbsp. 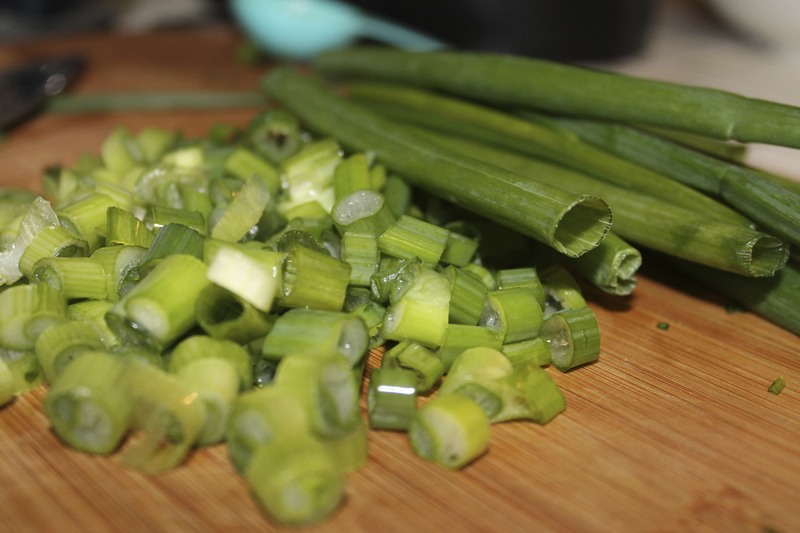 sliced scallions, 2 1/2 Tbsp. black beans To that, I added some freshly-torn iceberg lettuce. Use your judgement as to how much to add. I filled up the rest of the bowl to the top with the lettuce, then added the sauteed corn and tossed it all. Next, I brushed some peeled and deveined shrimp (tails left on) with the same cilantro lime juice/olive oil mixture that I used on the corn and sauteed that on high until cooked through, about 5 minutes. 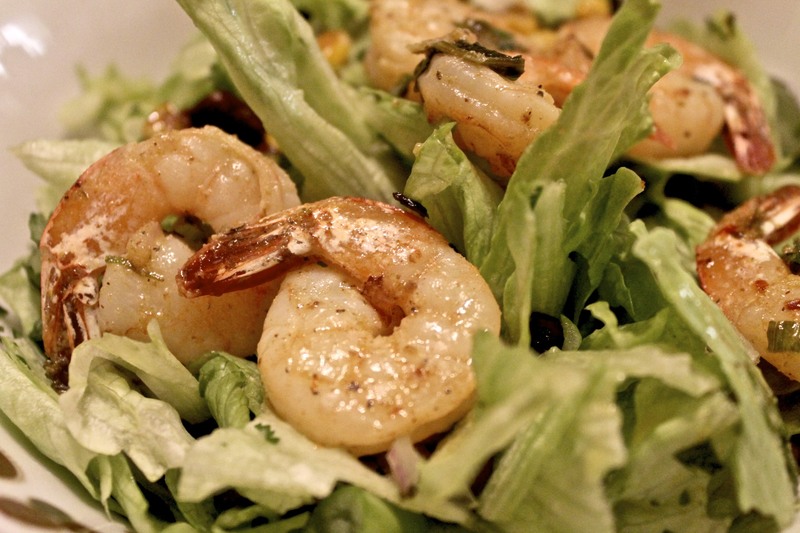 I drizzed the salad with the lime oil and topped with shrimp! I served it with tortilla chips to make it a “tostada” like salad, but if you’re counting carbs you can skip out on that. I just used the chips to scoop up the good stuff on the bottom of the bowl after my lettuce was gone! It was deliciously light and satisfied my tex-mex craving. I highly recommend making this on a night where you’re tummy is growling but you don’t want to overindulge. 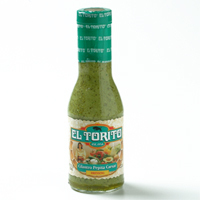 I also put out some of El Tortito’s brand Cilantro Pepita Dressing to use on the salad. It was a nice addition and you only need just a little, as it packs a powerful punch when it comes to flavor. Trader Joe’s sells their own knock off of the stuff and it’s equally yummy.